With simple step-by-step instructions and 175 delicious recipes, this book will have even the timidest beginners filling pantries and freezers in no time! Put ’em Up! includes complete how-to information for every kind of preserving: refrigerating, freezing, air- and oven-drying, cold- and hot-pack canning, and pickling. 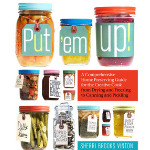 Sherri Brooks Vinton includes recipes that range from the contemporary and daring — Wasabi Beans and Salsa Verde — to the very best versions of tried-and-true favorites, including Classic Crock Pickles and Orange Marmalade.